I really don't understand why Nintendo is announcing new 3DS titles at this point. I love the console and all, but it really is legacy now, and supporting it is just pulling resources away that could be invested into Switch development. The games that were announced in the Direct are all the kinds of games that you would expect right at the end of a console's life. Cheaper, easier productions that would be handled by B-teams within Nintendo. The pick of the bunch is a brand new Dillon title - Dillon's Dead-Head Breakers. For those of you who got into the 3DS early, Dillon's Rolling Western was an attempt by Nintendo to bring together tower defence and action gameplay. It was a deeply flawed, but also very enjoyable in its own way, so it's good that Nintendo is taking another spin at it. This new game is compatible with Miis (which is nice to see since Nintendo otherwise seems to be killing those off), and has multiplayer features that will hopefully help deepen the strategy of the core action. There was also a new Mario & Luigi RPG (for release in 2019 - really, Nintendo, really? ), a remake of the original Luigi's Mansion (the one that was released on the Gamecube), and a new WarioWare mini-game compilation. There's enough in there for people with 3DS consoles to feel like they haven't been abandoned by Nintendo, I guess, but I have to wonder why any of those games really needed to exist. There was some really great stuff announced for the Switch at this Direct. 1) Okami is coming to Nintendo Switch, for a start. Notwithstanding that this is the 50th version of the game (that might be a slight exaggeration), Okami is a genuine classic and having it on the go is well worth the re-purchase. The Switch version will have motion control gimmicks and the like, so will feel more like an extension of the (arguably superior) Wii version. 2) Octopath Traveller has a release date! This JRPG from Square Enix looks absolutely mesmerizing, and if you played the demo that has already been released, you'd know that it's shaping up to be an intelligent and surprisingly dark adventure indeed. This one releases on July 13, which is actually sooner than I'd been anticipating. Nice. 3) No More Heroes on the Switch is shaping up to be balls insane, which is exactly what you want from Goichi Suda. In the game, Travis is sucked into old video games and needs to do battle across seven different game styles and worlds. And, of course, battle with incredibly interesting and distinctive enemies. It looks like a relatively low-scale production by Grasshopper Manufacture standards, but I am quite certain that this one will be wildly good fun. 4) Sushi Strikers was confirmed for a western release on Switch. This is a madcap match-3 battle game which looks nice and accessible (and has sushi! Sushi is good), while promising plenty of depth to the systems. Given that the game's about battling one another to eat sushi the best and fastest, the fact this will have online multiplayer is a nice touch. 5) CAPTAIN TOAD RETURNS! 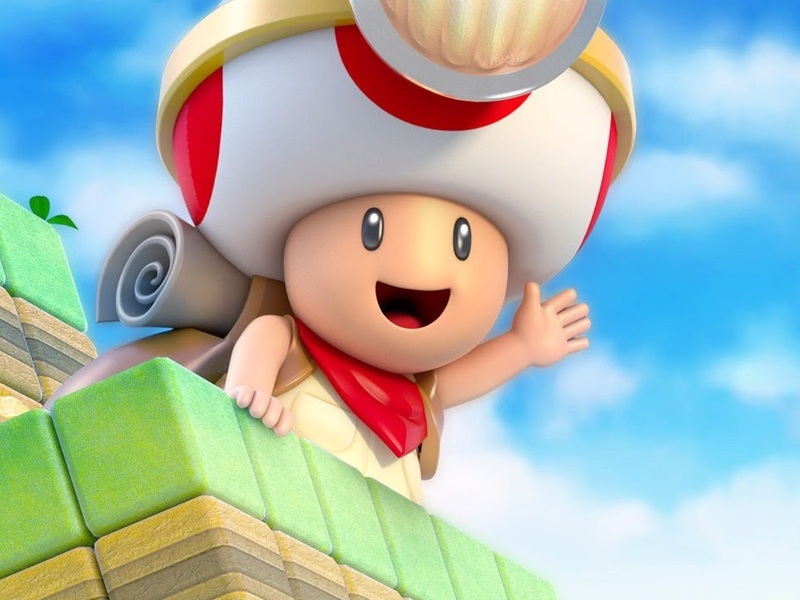 Of all the Wii U games that Nintendo published, I always felt like Captain Toad was the forgotten masterpiece. Delightfully clever puzzles and Toad at his most charming combined to offer something that, brief as it was, was impossible to put down while it lasted. Now it's coming to Nintendo Switch with some new levels and multiplayer functionality designed so that younger kids can enjoy the game while not getting frustrated by it (i.e. the parent or older sibling can help them through it). Other, more minor announcements were that Hyrule Warriors will release on Switch on May 18 (that'll be great), and that Little Nightmares and Undertale - both brilliant games that have been around for a while now, will be getting Switch ports. There will also be a port of the Crash Bandicoot collection, which will be the first time a Crash platformer has landed on a Nintendo console. Finally, there was some stuff regarding Splatoon 2 - new costumes and levels and esports stuff that didn't exactly grab my attention. There's also new single player content coming. And then was the big final reveal; Nintendo showed off a video with the Splatoon characters handing around a Smash Bros. logo, thereby confirming that Nintendo is working on a new Smash Bros (well, duh), and that the company's new big property would be a part of that new Smash Bros (well, duh). With absolutely no other information on that game, it's hard to get too excited by it - heck, the reveal being so limited suggests that production of the game is in such an early state that it may well pushed back a very long time before we actually see the thing released.